We enter the Northern Territory with an unfamiliar feeling. A desire to push on through this alluring patch of our country, stopping only at the attractions fringing the most direct route south to cooler pastures. Although this is an unfamiliar feeling on our Australian expedition, we realise we experienced the same inner drive just over a year ago when travelling in sweltering pre-monsoonal India and we made a dash for the wave lapping shores of Eastern Sri Lanka. That being said, we maintain our focus on the present and enjoy the journey, remembering to keep the desire for our destination in the background. 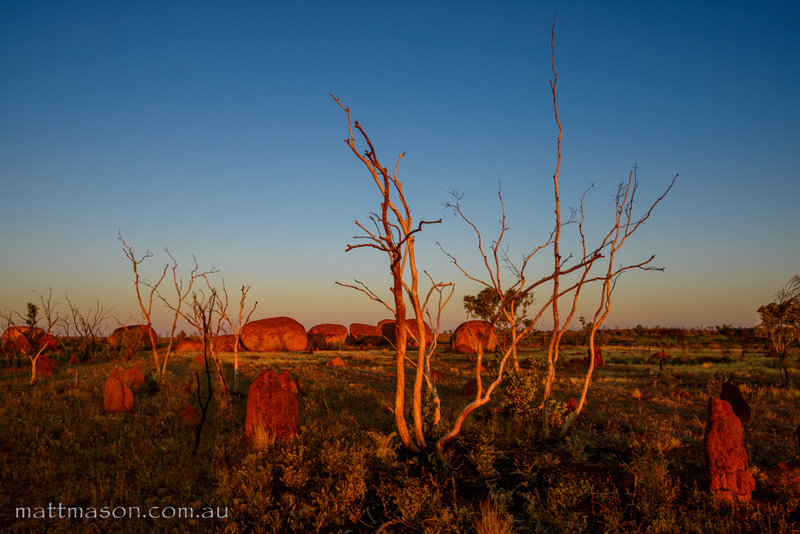 Our first night provides stunning ridges 360 degrees around us with a beautiful morning hike along a ridge rich in Aboriginal history. Benson gets into the Aboriginal spirit and paints his face with the red dirt. After driving an average of only 100km every few days while in the West, pushing between 500 to 800km a day wears us down a little but stopping always provides a pick-me-up. 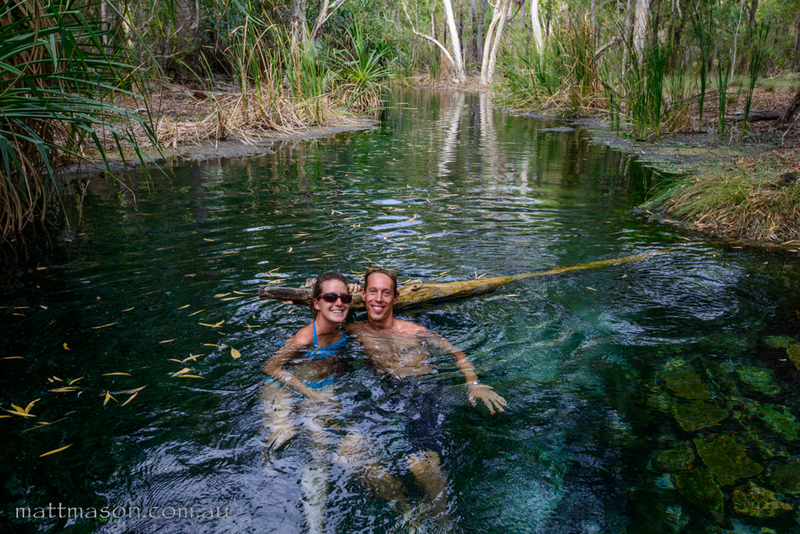 The pools of Mataranka definitely deliver. Our friends of the road Andy & Che told us about a couple working at the Mataranka Roadhouse with a similar story to ours. Ryan and Peta, like us, made a snap decision to pack up, rent out the house and hit the road. Bringing along their best friend Jango an adorable boxer. With the majority of our fellow travellers being of the grey nomad variety, it’s refreshing to hang out with some crew our own age. We park up the van behind the roadhouse and enjoy a good yarn over a few beers. The Daly Waters pub is a quirky little watering hole in the middle of The Territory. I’ve seen it countless times before on TV, but it’s fun to get up close to the mosaic of drivers licenses, pictures, stickers and stories from all corners of the earth, stuck to the bar and walls underneath the fine collection of bras hanging from the ceiling. 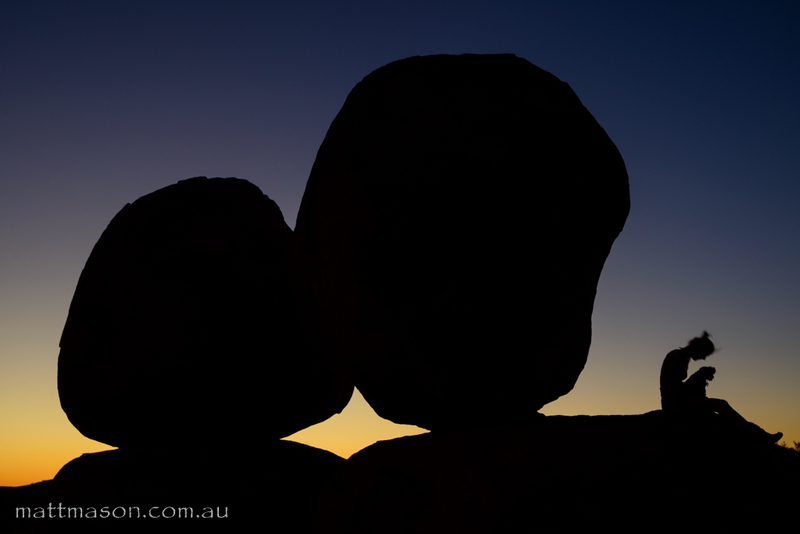 Exploring the Devils Marbles lets us and the dogs stretch our legs after a long day in the car. I service the car in the Alice Springs auto shop car park while Jill stocks up the fridge and pantry. 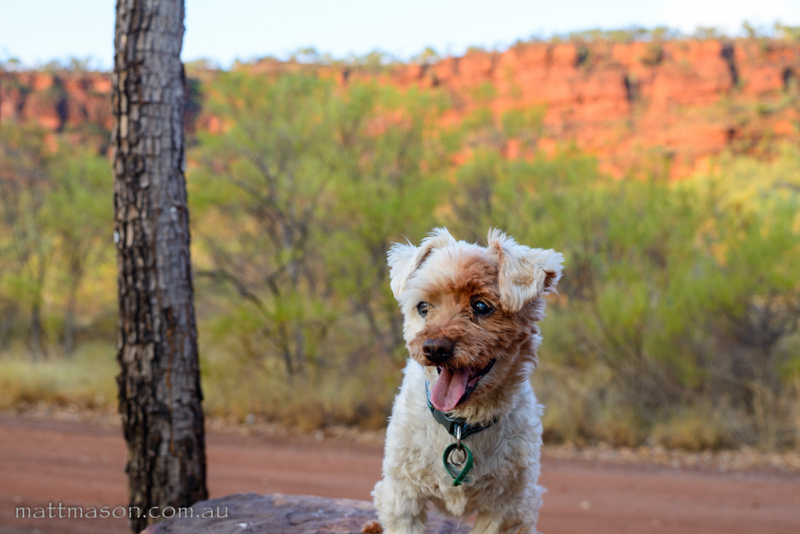 The next couple of nights are spent in the bush off dirt roads and we get up early to hike around Kings Canyon. The domes on top of the canyon look just like those of the bungle bungles. 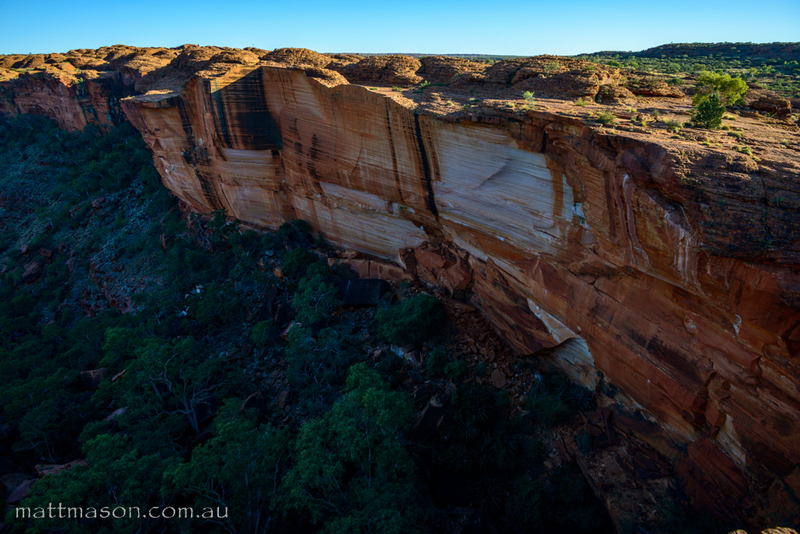 The cliff face of the canyon is so sheer it’s like it was split with a giants axe! We spot Uluru from over 100km away. As we get closer, the presence of this rock overwhelms us. It stands so tall and proud, jutting straight out of the desert, commanding a sense of awe. I have the time of my life shooting her from all different angles in various light. 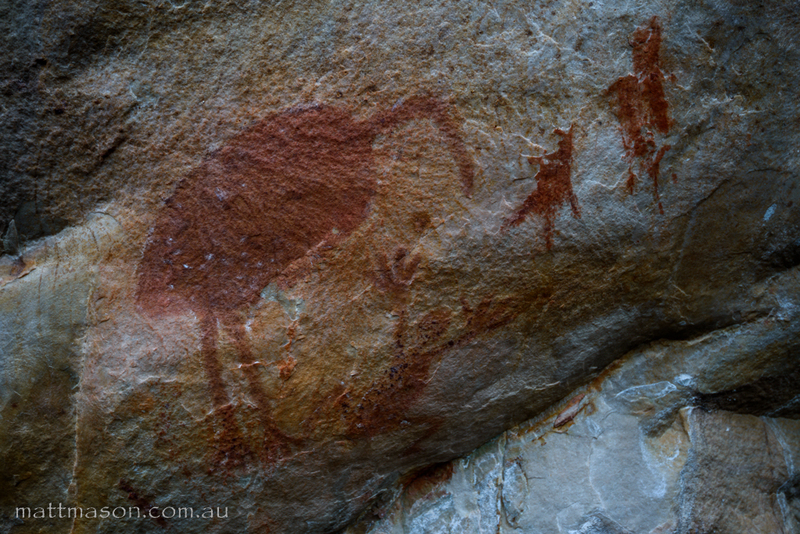 We hike the 10km around the base early one morning and enjoy all its faces and the rich Aboriginal culture and history. We spend our days in the pool or in the van running the manual air con for the dogs. We keep wetting their hair every half hour and place them in front of the fan. It was so hot our solar system even stopped working, I thought these things loved the sun! Then our awning got destroyed by a crazy gust of wind, which disappeared as quickly as it arrived. 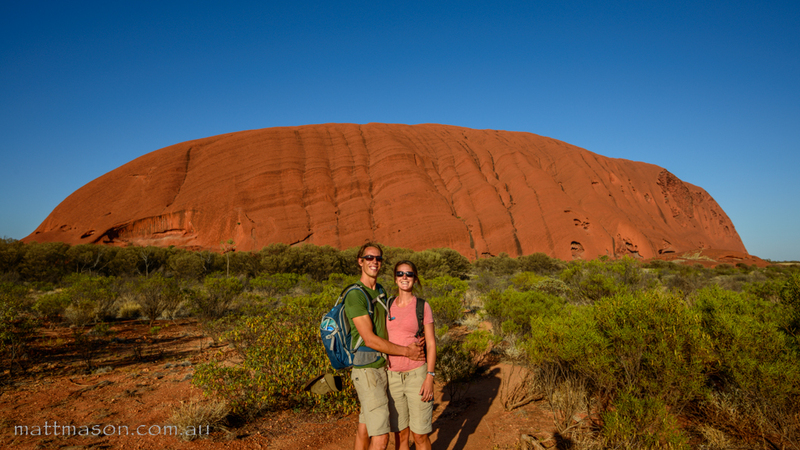 We also spent a morning hiking through the beautiful Kata Tjuta. We had a brief but awesome time in the NT. We will definitely be back here when the weather is more hospitable for us and the dogs. 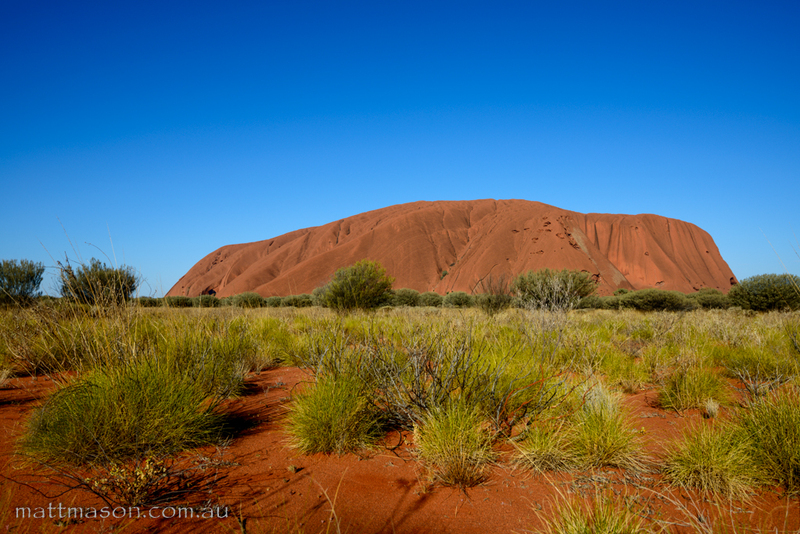 This entry was posted in Australia, Camping, Hiking and tagged Ayers Rock, Daly Waters, Devils Marbles, Kata Tjuta, Mataranka, Northern Territory, Olgas, Uluru. Bookmark the permalink. That’s the cutest shot of Benson. 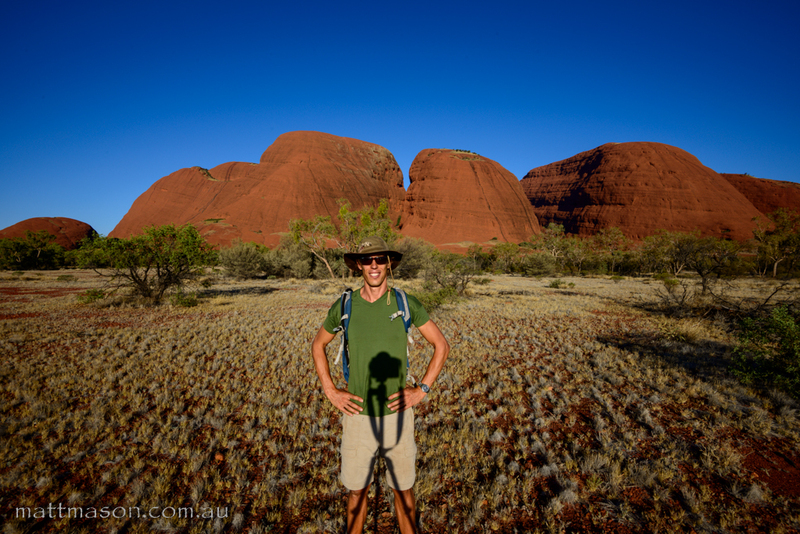 And you sure look like the Intrepid seasoned Outback traveller Matt with your hat, backpack and camera. Pics of “the Rock” are awesome – especially the purple one. Thanks mum. I had heaps of fun driving and hiking around to find new perspectives. It changes so much with the light too. That’s a classic shot of happy Benson which we see so much of. He loves going on walks and smelling new places.